iCab Mobile, The iPhone/iPod Touch Browser Alternative. 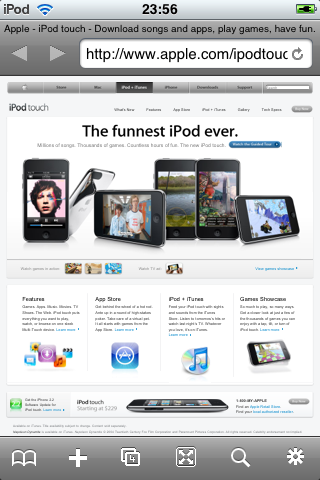 Are you tired or frustrated with Safari as your only browser choice on your iPhone or iPod touch? I know I am. I want Firefox to be available for my browsing experience. I also want the Flash Player but that is a topic for an entire post unto itself. As for the browsing options things just got a little better for all of us with the release of iCab Mobile. 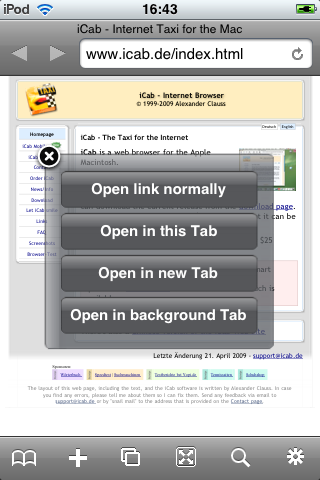 iCab Mobile is a web browser for the iPhone and iPod Touch that has a great feature set and some useful tools not found in other iPhone browsers. One feature is scrolling via a scroll pad (tap the screen with three fingers to activate) that lets you go to any location within the web page instantly. 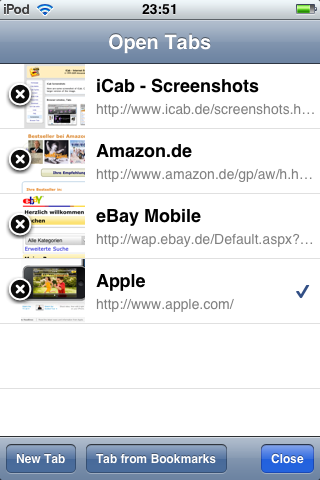 iCab supports Tabs, Bookmarks and has a built-in filter that blocks advertising banners. Tab support is a huge plus for me. 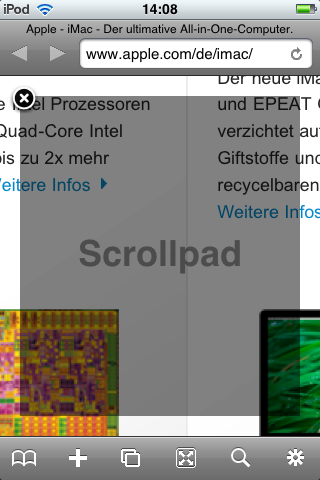 I know Safari sort of does this with multiple windows, but I like real tabs better. Another feature of iCab Mobile is that It has a full-screen mode which hides all toolbars so the web page can be viewed screen. iCab Mobile also has a built-in download manager can handle multiple downloads even over a 3G connection, and can upload files back to a computer over a Wi-Fi connection at a later time. Another feature that I am really liking is the auto-fill function for forms and fields that require you to fill in personal data. 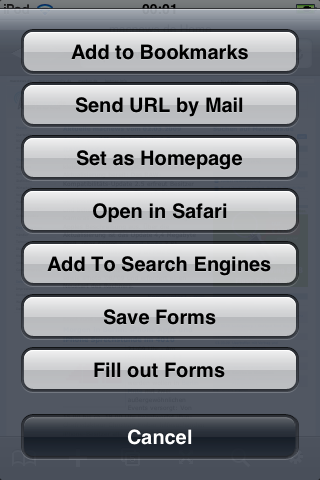 iCab Mobile can save web data and restore the form data content later with a finger tap. To help prevent identity theft the saved forms data can be password-protected. Other features include the ability to lock the screen in either portrait or landscape view. If selecting “private browsing”, no history and cookies will be saved. The Latest version sells for $1.99 on the app store or via iTunes. Not bad for a full feature browser.